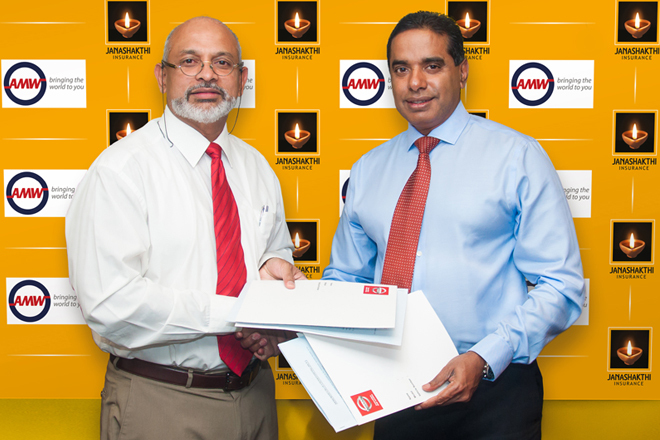 Janashakthi General Insurance Limited (Janashakthi) signed a Memorandum of Understanding (MoU) with Associated Motorways Ltd (AMW) to offer special value additions to Janashakthi Full Option policyholders. As part of the agreement, in the event of an accident, Janashakthi Full Option policyholders are able to have their vehicles repaired and attended to at any of the AMW Pitstop centers and AMW authorised service centers located island wide, irrespective of the make of the vehicle. Eliminating traditional delays, the Insurance provider will process claim settlements based on the damage assessments and repair estimates submitted directly to them by AMW’s team of experts. AMW will undertake all necessary repairs on the vehicle on an expedited, priority basis, and in the event of a minor repair will even enable online approval for Insurance which will not require the Insurance assessor to visit the workshop. “At Janashakthi, we constantly seek ways to add value to the lives of our customers, by offering convenient solutions, coupled with an enhanced level of service in all that we do. Therefore, it gives us great pleasure to partner with Associated Motorways, a respected leader in Sri Lanka’s automotive industry, to offer our customers convenience and peace of mind by providing a hassle-free and efficient claim processing service in the event of an accident. We look forward to seeing our customers avail of the benefit of an expedited service facilitated by Janashakthi and AMW in the days ahead,” said Prakash Schaffter, Managing Director of Janashakthi General Insurance Limited. Janashakthi Full Option policyholders will also be eligible for discounts on Nissan, Suzuki and Maruti Suzuki collision related spare parts and car clinics conducted by AMW. They will receive complimentary detailing and lubricant services, based on the nature and extent of repairs carried out. Janashakthi will also be collecting the salvaged parts directly from AMW, thereby sparing policyholders the inconvenience of having to transport them over to the Insurer themselves. “The partnership between Associated Motorways and Janashakthi, one of Sri Lanka’s leading Insurance providers, is well aligned with our mutual vision of understanding and meeting our customers’ needs at all times. We strongly believe that the decision to facilitate an automated claim processing service will benefit customers of both parties by providing an efficient service with minimal delays. As two organisations that believe that customers are an intrinsic component of our operations, we will continue to monitor the process with the aim of providing greater value to them along the way,” said Samantha Rajapaksa, Group Managing Director of Associated Motorways. Janashakthi Insurance PLC, founded in 1994, made its mark in the industry as an innovator and household name over a span of two decades. As an organisation that thrives to deliver excellence in Customer Service by addressing the Insurance needs of its customer base, Janashakthi has an island wide branch network of 109 branches, a 24-hour call centre and around the clock assessor service. Today, the Company stands strong as a leader in Motor, Non-Motor and Life Insurance services, and with its recent acquisition of AIA General Insurance Lanka Limited, continues resolutely on its vision of lighting the lamp of Insurance in every home and work place.